Grate the soap on the cheese grater. If your soap doesn't shred like a hard cheese (and it just turns to powder), your bar of soap is probably old and dried out. 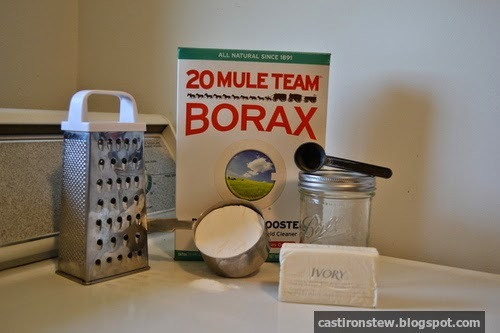 Measure out the washing soda and the Borax. Put all of the ingredients together in the bowl and mix it up. Put the powder in the jar of your choice (which I sincerely hope is a Mason jar!) and put on the lid. Use 1-2 Tbsp. per load of laundry. DO NOT add all of the powdered laundry detergent to one load, or your laundry room might end up looking like one of those cartoons (where the kids add too much soap to the bathtub and it ends up flooding the whole house with bubbles.) What? It could happen! Note: This recipe is for a top loading washing machine. Thanks you so much for reading the Cast Iron Stew blog! While I am getting the site up and running, it might be a little bit of a disaster area. 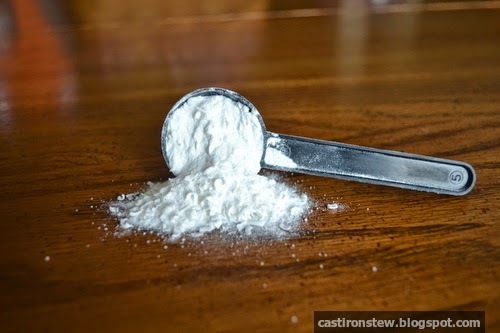 Thanks and credit to the Duggar Family Blog for use of their powdered laundry detergent recipe.